Vans fans, another collaboration will be dropping this weekend and hopefully they'll reach here in the Philippines as well. 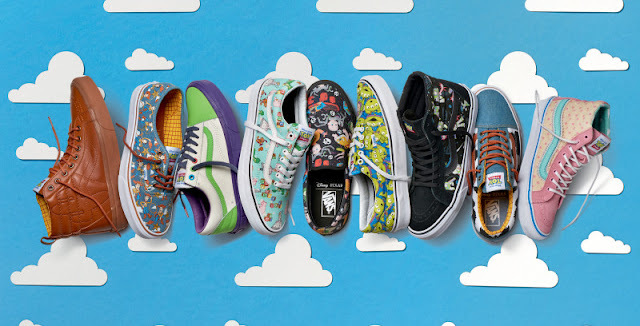 The Vans X Toy Story collaboration will be spearheaded by your favorite characters, Woody and Buzz in different design executions that will be heading Vans' famous silhouettes like the SK8-Hi and Old Skool. Also other supporting characters from the franchise like Little Bo Peep and the Aliens will also be seen in other silhouettes. I think both young and not so young sneakerheads will dig this collaboration and you won't be waiting long since they are set to drop on October 7, 2016 and just like the Nintendo and Disney collection, I am expecting them to reach here in the Philippines maybe a month later.